Adam Tucker, of Mountain Air Spray, drops golf balls onto the 18th green at Yampa Valley Golf Course as part of the Yahoo Golf Tournament and Ball Drop to benefit the Craig Kiwanis Club and Boys & Girls Club of Northwest Colorado. With more than 2,000 balls dropped from the plane, this is one of the most spectacular golf ball drops in the USA. Craig — Perfect weather set the stage for a great day Saturday for participants of the Yahoo Golf Tournament and Ball Drop at Yampa Valley Golf Course. At least 42 teams signed up for the event, which was organized by and benefited the Craig Kiwanis Club and Boys & Girls Club of Northwest Colorado. “In the golf world, if you have a day like we had (Saturday) weather wise, it certainly makes everything go smoothly,” said Kiwanis member Chuck Cobb, who served YVGC as head golf pro and director of golf for more than 20 years. Boys & Girls Club Executive Director Dana Duran echoed Cobb’s sentiments. 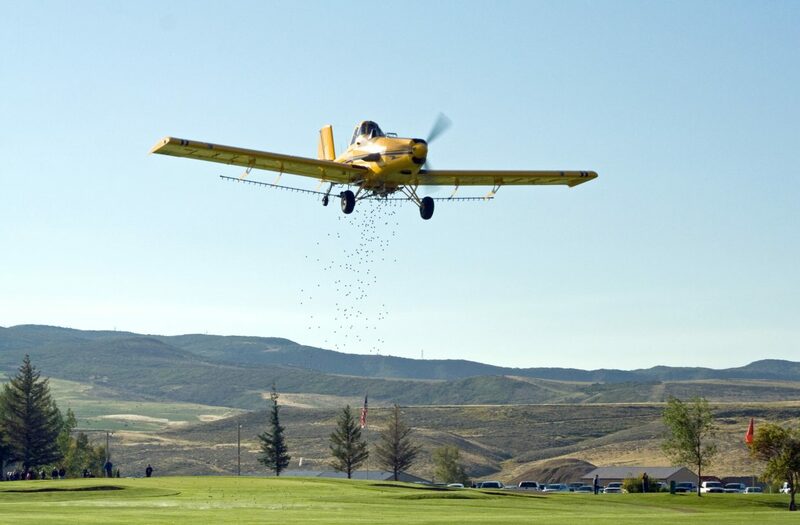 The event began Saturday morning with the ball drop, in which people paid for either red or white golf balls to be dropped from a small plane over the 18th fairway. Whichever balls landed closest to the hole won prizes totaling more than $7,500 in value from an assortment of sponsors. Prizes included Denver Broncos tickets, golf equipment and packages, gift certificates and more. This is the second year that the Kiwanis Club and Boys & Girls Club have partnered to run the event. The tournament originally was started by the Knez family, with the added support of the Severson family, and proceeds would benefit a variety of local organizations. With the strong turnout Saturday, the funds raised will go a long way toward supporting new youth leadership programming for the Kiwanis and Boys & Girls clubs.